Over the years I have shared many photos of black requiem vestments replete with skulls, scythes, bones, even the poor souls in Purgatory. 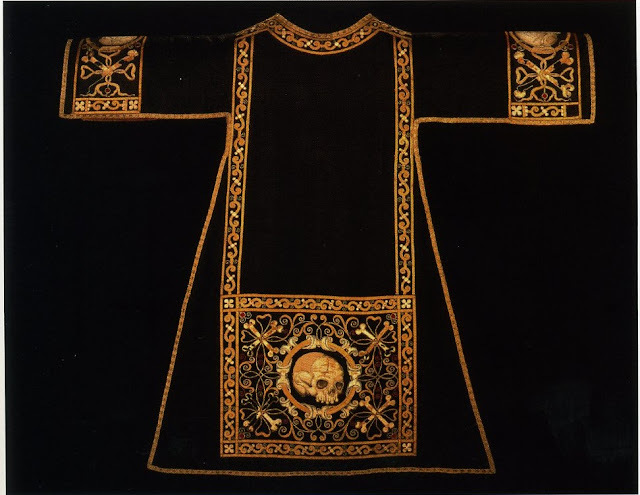 These vestments usually inspire a great deal of interest for reason of their relative rarity and also for reason of these symbols. Reaction to them is either one of great interest or, alternatively, a certain hesitancy and discomfort. As to why, I have yet to find any documented rationale. Perhaps they were deemed too morbid or there was a concern that they might obscure the Christian hope in the resurrection of the dead. It has also been suggested by some that it may have been to do with negative associations with items such as plague panels and plague crosses. 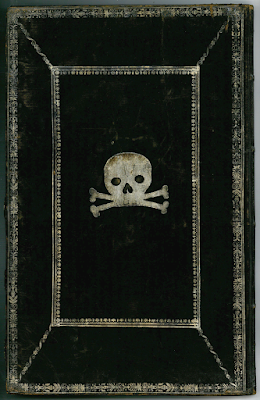 On the other hand, these sorts of symbols have historically been employed within the Church as memento mori, reminders of mortality and the four last things -- death, judgement, heaven and hell. Whatever reasons informed this decision in the past, today it seems that a good case could be made for the prudence of rescinding this prohibition (or at very least loosening it). In the first instance we live in a time when there is a woeful lack of awareness around purgatory. Rarely does one hear Catholics speak of it. Going hand in hand with this is a related lack in the offering of prayers and Masses for the faithful departed. 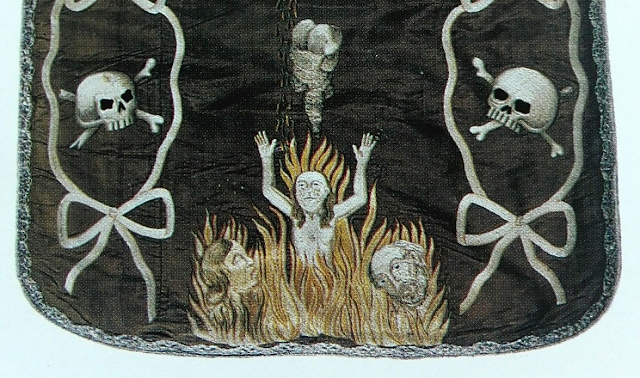 Were images of the souls in purgatory to be allowed on black vestments, these could present a powerful teaching moment, reminding people of this reality and of the importance of praying for the faithful departed. In the second instance we likewise live in a time that places very little thought on three of the four last things; namely, death, judgement and Hell. In fact, in Western societies there is a particular avoidance of thinking of one's own mortality, almost to the point of denial, which of course is also not helpful in promoting a life of penance, avoidance of sin, and the pursuit of Christian virtue. 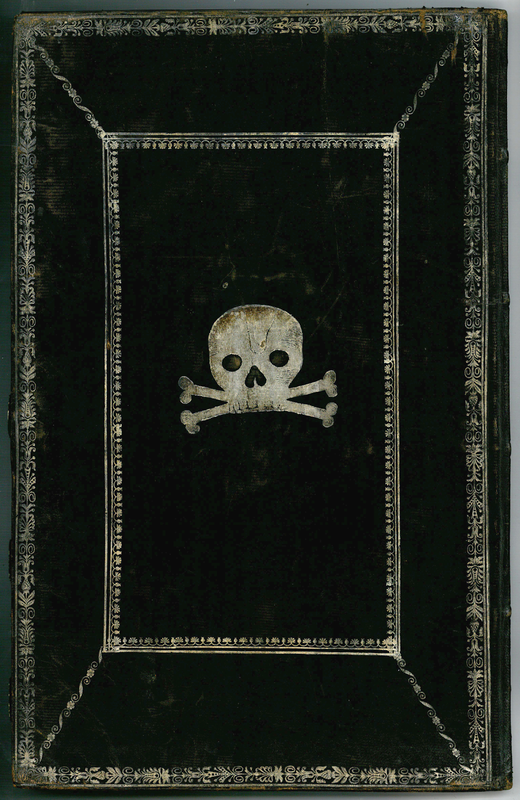 Here again, the presence of memento mori such as these, particularly within the context of the Requiem Mass, could be a useful and important counterbalance to this far too neglected reality. Evidently in executing such designs they would need to be done tastefully and ideally they would also find ways to incorporate the Christian hope in the resurrection in some way as well. But given the aforementioned issues that our culture and time struggles with, I firmly believe these memento mori should themselves find some sort of resurrection. As far as the feelings of discomfort they can trigger within some, it may be worth considering that sometimes we need to feel that little prick. We should not lose sight of Christian hope of course, but these two poles are not mutually exclusive and in fact together they form a fuller Christian picture. The issue we face today is precisely that there is a cultural avoidance of this fuller picture, and it has even found its way within the walls of our churches. We need a counter-balancing corrective.